NEW COPPER MINE VISITOR CENTER OPENS IN 2019! See two of Utah's greatest wonders: the largest man-made hole on Earth and the saltiest lake in the western hemisphere! Visit the Great Salt Lake State Park Marina and the new visitor center and observation deck of the Kennecott Utah Copper Bingham Canyon Mine on this 4.5 hour fully-narrated sightseeing tour which departs daily from downtown Salt Lake City. After pickup from a downtown Salt Lake City hotel you'll travel 20 miles to the shores of the Great Salt Lake. Along the way, your expert local guide will entertain you with tales of the myths and mysteries of the Great Salt Lake. At the Great Salt Lake State Park you can stroll along the beaches and even swim in the lake it is impossible to sink in. Then travel to the largest and richest copper mine in the world, one of the few man-made creations visible from space! 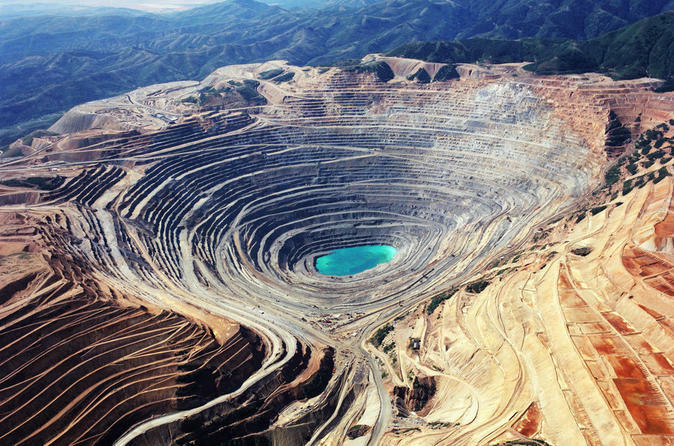 Along the way your tour guide will entertain you with stories of this historic copper mine and you'll pass by the world's largest waste-rock deposits. Your tour guide will explain the sights and share fun facts about the operations of the mine.